What do Amish do for fun? Amish life is not all hard work. Amish have numerous opportunities for recreation, although the boundary between leisure and ‘work’ can be blurred. What some Amish might consider enjoyable–shelling peas with sisters or working a team in the fields, for instance–a non-Amish person may see as drudgery. At the same time, there are numerous activities Amish participate in one could classify as more unambiguously “fun”. As is true of most things in Amish society, typically, Amish leisure activities are shared. Getting together for a board game evening or heading out on a hunting trip with brothers is a way to get relaxation as well as spend family time. Amish do enjoy solo hobbies such as reading, embroidery, and crossword puzzles as well. Leisure time is typically time spent with others, and for the Amish this means with a web of family and friends. Amish enjoy many outdoor activities involving nature and wildlife. There are many hunters among Amish men. Amish hunt deer, birds, and sometimes take trips to the west in search of larger game. Amish use both firearms and bows to hunt. Fishing is also popular among Amish of all ages. An added bonus of these activities is the fact that a successful hunt or fishing trip results in food for the family, a plus for the practically-minded Amish. At the same time, some Amish do collect hunting trophies, and there is usually at least one Amish taxidermist in the larger communities. Other outdoor activities include birding, nature walks, and boating. Many Amish are avid birders. Amish keep lists of birds spotted on the farm and may take trips to different areas in hopes of adding other species to their tally. Camping trips are another family activity popular among Amish. Amish may camp in backyards or in some cases on a piece of land owned for recreation purposes. Amish in some communities own small motorboats. In Northern Indiana, it is not uncommon to see a buggy hauling a light boat to one of the numerous lakes in the area. Sports like waterskiing are not common among Amish, however, though swimming is. Amish have an ambiguous relationship with sports. Some Amish see little harm in sports participation. Others feel sports and games best left to children. Popular sports among Amish include softball, volleyball, basketball, and hockey. Some Amish may follow a favorite sports team. Read more on the Amish and sports. Amish also play numerous family games at home. Traditional board games are popular, such as Life on the Farm, Scrabble, and Trivial Pursuit. Some card games are popular as well, such as Uno, Scum, and Dutch Blitz. Amish enjoy games such as Trivial Pursuit, and often make an evening out of playing a game. The point is in getting family and friends together and enjoying one another’s company. A bowl of popcorn or fresh fruit might be passed around as a snack and to provide energy for games that can sometimes last late into the evening. Reading is also a popular pastime among Amish. Amish libraries often include numerous books on history, nature, biographies, as well as religious books. Some Amish read fiction. Others subscribe to an Amish and Mennonite newspaper such as the Budget or Die Botschaft, or may receive the local newspaper. A number of Amish subscribe to a national publication as a way of following the news of the world. Letter writing is another popular way in which Amish spend free hours. Letter writing is a way to stay in touch with relatives, exchange advice, and maintain community. Sometimes it is the most practical way to stay in touch over long distances. Circle letters are communal letters which are added to and then sent on to the next recipient on a list. Circle letters may be maintained by family, or groups with similar interests, such as teachers, cancer survivors, or friends from a buddy bunch. Visiting relatives is another common way of spending down time among Amish. Visiting may take place in the evenings but most commonly occurs on Sundays after church. It’s typical that one may pay a visit to a sibling’s family, or to a family in one’s church district with a new baby. Often these visits are unannounced, so an Amish family must expect to see guests at nearly any time on Sundays, even in the evening. Visitors may come for a coffee and a piece of pie and a chance to exchange news, catch up on happenings, and make plans for the next get-together. A discussion of Amish forms of entertainment would not be complete without mentioning auctions. 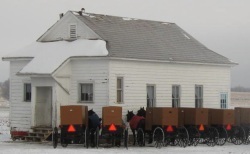 Amish frequently put on auctions, often to benefit a cause, such as the long-running Haiti benefit auctions, or to benefit a local parochial school. Other auctions occur when selling items from an individual’s estate. Livestock and horse auctions are common as well. Well-known auctions include the Lancaster County mud sales, and the auction to benefit the Clinic for Special Children, also held in Lancaster. An auction is a popular place for the entire Amish family to socialize, eat good food, and purchase useful items for the home, farm, or business. There are a variety of ways Amish enjoy leisure time. Some activities may be more common or popular in some communities or churches. Some may not be sanctioned in others, such as some sports participation in more conservative communities. Regardless, Amish see leisure time as a time to both relax and to enjoy the company of friends and family. In this way leisure time serves to recharge batteries and strengthen community at the same time. Amish Online Encyclopedia: Where can I find an Amish auction? and Do Amish go on vacation? 11 responses to What do Amish do for fun? What kind of swimsuit do the Amish wear? I’ve always wondered. My husband and I love to attend the school auction at Cannelburg, IN on the Saturday of Labor Day weekend. 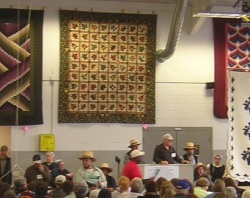 There are usually about 125-150 quilts auctioned; all hand quilted. Being a quilter, I love to see the excellent handwork and the top quality of workmanship! I’ve managed to only buy TWO!!! lol I now own 4 Amish quilts and treasure them! When the Amish play Scrabble, do they use English words, or do they get high word scores for Pennsylvania Dutch ones? What a wonderful post this day, thanks Erik. I actually goofed a little on the url of today’s post. I unintentionally made it the same as this previous Encyclopedia page entry, so I think the email subscriber link is sending people here. Just as I suspected — good old fashioned “fun” — things we all used to do, before TV and the Internet. 🙂 Sometimes, wish for those days again–in my case, the 1950’s. On the question of swimsuits — I have seen pictures (far-away, and not intrusive), of girls sitting on the beach, near Pinecraft (Sarasota) in their dresses and caps, getting a little sunshine. Can’t say if they swim in their dresses, or what? Will leave that question to someone who knows more. The quilt shows are wonderful places to see the magnificent art and patience, and creativity, with making a quilt!! So enjoyed one we went to in Pinecraft, FL. Sharron, I too remember those days before TV and internet. Going to grandma’s house on Sunday for fried chicken and games with the cousins. Can we turn back time? YES, sometimes wish we could “turn back time” — it was always the “norm” to eat at grandma’s or a relative’s house on a Sunday!! Since my mom came from a family of 10, there was always a good variety of aunts/uncles to go visit! AND each with it’s fond memories, much like the Amish I’m sure are doing! I love doing quilting in my spare time. That list sounds just like my childhood and I am still enjoying many of those activities as an adult. In our area, Big Valley, PA, one of their favorite recreation time is to go over to the next valley along the Juniata River, where besides being able to fish in the river, they watch the trains as they pass through the little village of Mattawana. I, for one, grew up there and my grandmother had a little village store. The Amish for as long I as can remember (going back to the 1950’s) would come over in their horse and buggies for the day. Usually a day in the summer, and always on Assention Day also. Now they have a van driver bring them over for the day, and often you’ll see a little tent put up so the children can take a nap, and also a dining canopy. They keep count of the trains going through, how many engines pulling how many cars, etc. Sometimes you will see a horse and buggy making the trip. They have about a 12 mile trip over a fairly high mountain (Jack’s Mtn). Another activity they will do for fun, is go just to the top of Jack’s Mtn, where you will find the Hand Gliders taking off from the top and gliding over the valley. They find enjoyment in a number of lifes simple inexpenise activities! Oh, almost forgot, we took a family to the zoo one year; the father wanted his kids to see the different animals there, so we rented a van and all went to the Pittsburg Zoo. Then on the way home, we had a picnic at Horseshoe Curve, near Altoona…..yep, we watched the trains go around that famous manmade railroad attraction. Life is good! That sounds like fun!! Sometimes the simplest things are the most enjoyable! Hope that does not ever change! Leave a reply to What do Amish do for fun?